Breanna elevates for two of her 22 points. She also had 15 rebounds. Neil Enns/Storm Photos. 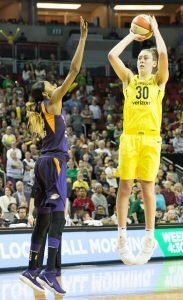 Seattle – With just under four minutes to play in Sunday’s season-opener against Phoenix, Breanna Stewart stepped to the line with a chance to tie the game. After trailing for most of the night, it was the Storm’s first opportunity since the game’s opening moments to pull even. The third-year forward sunk the first to cut the gap to one. The second rimmed out. And that was as close as Seattle would get. It was that kind of night for the Storm, coming up just short in an 87-82 loss to the Mercury at KeyArena. 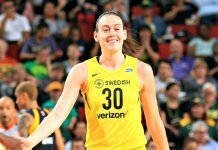 Brittney Griner led all scorers with 29 points for Phoenix, while Breanna Stewart posted her first double-double of the year with 22 points and 15 rebounds. The Mercury (2-0) led by as many as 14 in the first half, and made good use that cushion for most of the night, as Seattle (0-1) spent most of the final 20 minutes trying to overcome their slow start. 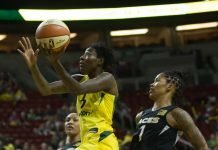 For Storm head coach Dan Hughes, Phoenix showed early on the benefits of having played a regular-season game (an 86-78 win over Dallas on Thursday). But each time Seattle pulled within one possession, Phoenix had an answer. That included the sequence after Stewart split her pair of free throws. Instead, the Mercury used a 7-0 run over the next two minutes to pull ahead by eight. Rookie Jordin Canada had nine points and four steals on the night. Neil Enns/Storm Photos. 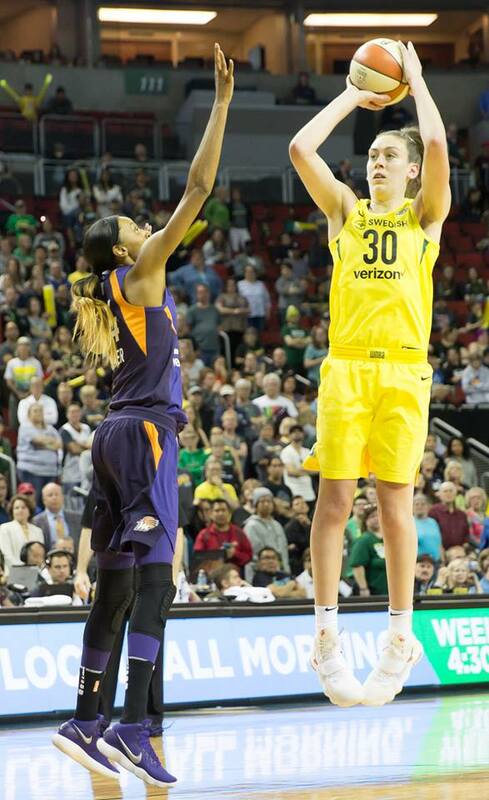 Seattle mounted one final push over the game’s final 90 seconds, with a Sue Bird jumper and a coast-to-coast steal and score from first-round pick Jordin Canada — who finished with nine points in her WNBA debut — pulling the Storm within four. Back-and-forth baskets and free throws left the Mercury up three with 10 seconds left. That gave Seattle one final chance to force overtime. A deflection in the corner on the next possession by Diana Taurasi against Stewart with three seconds to play forced a lengthy review, but the call on the floor kept the ball with the Storm. But off the ensuing inbounds pass, Stewart’s heel was on the sideline. Finding Stewart in the corner wasn’t the only outlet Hughes had drawn up. Griner called it a hard-fought win for her team. The two teams met back-to-back in preseason play, and the Storm took both games. They meet for a final round Wednesday in Phoenix. Tip-off is set for 6 p.m. PT. Before the game, the team honored late owner Ginger Ackerley, who passed away in January at the age of 79. Yvonne Turner missed Sunday’s game with a calf injury, while Noelle Quinn was questionable but did not play with a right knee injury. 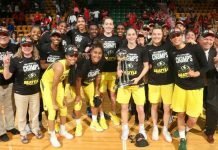 Spotted: Oregon State head coach Scott Rueck was on hand, with Phoenix taking Marie Gulich with the 12th pick in April’s draft. 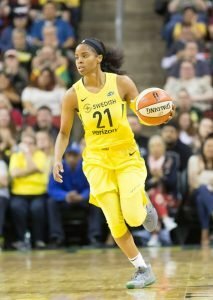 She played three minutes, and finished with two points.